Hello everyone..Happy sunday to you all.. It's started raining here,so this sunday is special for me,as i like rain so much and thoroughly enjoy crafting,coffee and rain,wow..such a good combination..but its bit difficult to take photos in low light,but i managed somehow today..I like to play along Muse challenge and this week's muse is my dear friend and very talented Sweety Gupta,I like her work very much and find it very inspiring.. I focused on pink lotus,green leaves and golden accents and also the criscross lines and little pearl drops. I used quilling technique for lotus as i don't have any lotus stamp with me and made criscross patterns using embossing tool and fevicryl white outliner for pearl drops. handwritten the sentiment with golden pen. I have always found quilled cards so pretty. It adds so much dimension and interest on the card. :) But quilling needs patience, and I find that I lack a lot of it. This card is very pretty. What you did with the embossing tool and fevicryl outliner is clever. :) Thanks for playing along the Muse challenge. Hugs, Sweety. 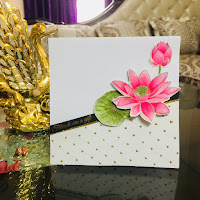 Beautiful and eye-catching card! I don't know how to do quilling but your flower looks fabulous. 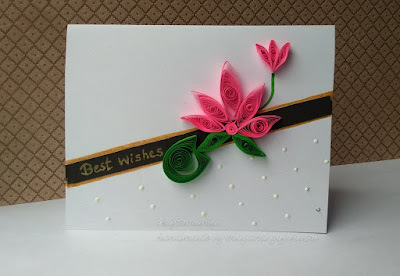 Gorgeous card Mugdha, your quilled flower is striking on the white. I remember learning to quill about 35 years ago when I accidentally went to a class thinking it was quilting, I have a box of goodies in my stash somewhere. Beautiful quilling! I am fascinated by this technique! Thanks so much for joining us at Muse this week!